A face gear is like a bevel gear in that the teeth are not round the edge the gear but are on the face of the gear. The teeth are triangular in form though the angles can vary. 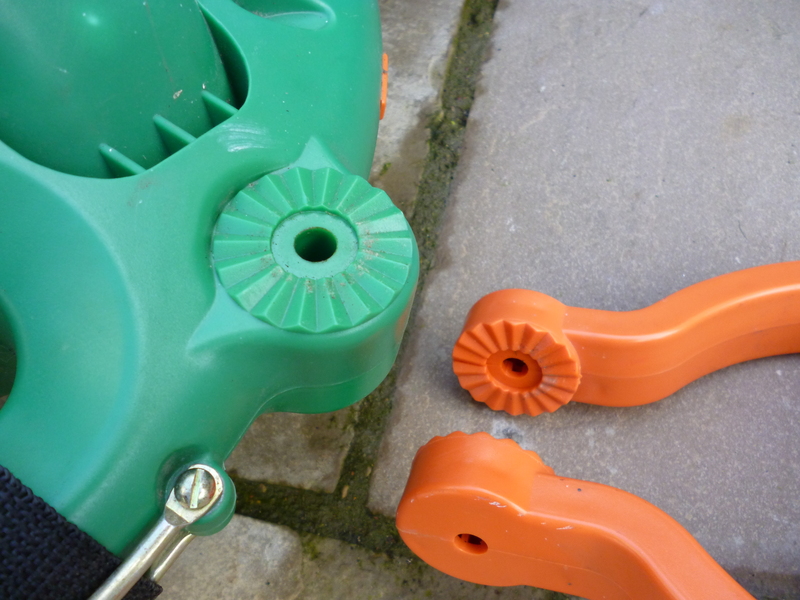 Consequently, the teeth do not “roll” like the teeth on a gear. One face gear will only fit another face gear with the same size and number of teeth (sort of). Usually the angle of the teeth on both gears would be the same. Furthermore two face gears fit face to face but do not move relatively to each other. But they do lock together very precisely. Two face gears can mesh with each other but have to be pulled apart and then fitted together in the same or in another position. If the angle is about 45° a pair of face gears can be used to lock two components at varying angles to each other. If the angle of the “teeth” is very large the faces can be pushed into sliding over each other if they are a loose fit and held together by a spring.This can be used as a flexible joint. It is “locked” in a particular position. It then takes a specific force to make one arm rotate relative to the other. This can be used as a joint on, for example, a table lamp. Using two pairs of face gears where one pair has a different number of “teeth” to the other pair can be used to make very fine differences of angles. It is also possible to make a face gear were the angle is very small. In this case two similar parts will lock together without any possibility of slipping. This is the basis of the Hirth coupling. In this case the width of the teeth is small compared to the width of the face of the gear. A crown gear is like a face gear but the width of the tooth is again only a small part of the width of the whole gear. With the method outlined above the teeth are triangular. In ancient times triangular teeth were considered acceptable. They are to be found on the Antikythera mechanism. They are also found on medieval clock. But with a gear of this form it is quite possible to cut teeth of a proper shape. The point of the face gear is that it is possible to cut teeth across the whole face of the gear where the size changes but not the form. The workpiece is made from a round bar. It is turned down to the required diameter on the lathe. Most faces gear will need a hole in the center. This can be drilled whilst the bar is in the lathe. Face gears can be made using a simple dividing head. The “angle” of the teeth is set by swivelling the dividing head round to the required angle. The teeth can be cut using an endmill. This will cut a 90° tooth if the vertical head is tilted at 45º. In the example the dividing head is swivelled by 5°. 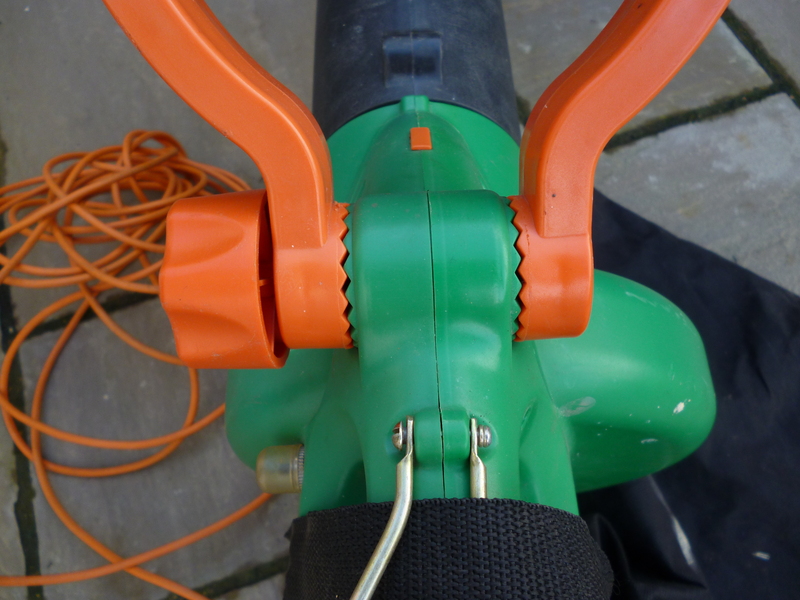 The cutter being used is a 90° cutter on a stub arbor. 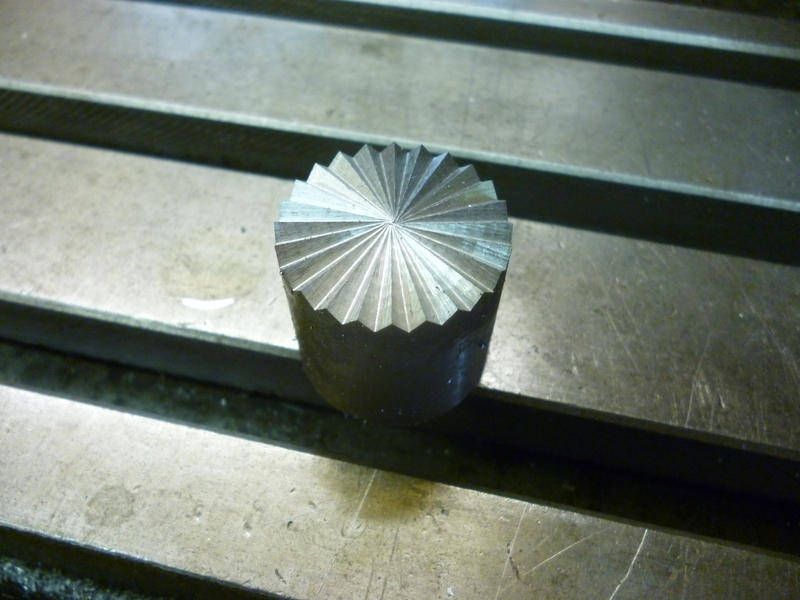 If the end of the bar has been turned so it is flat then, if a cut is made and the end of the cut touches the middle of the face, the tooth is not symmetrical and two face gears made like this will only touch round the edges. To make two face gears that touch each other over the whole length of the tooth, then a cut from one side has to be such that it goes right from one side of the workpiece and ends on edge of the opposite side. Though this would only happen if there are an even number of cuts on the gear. 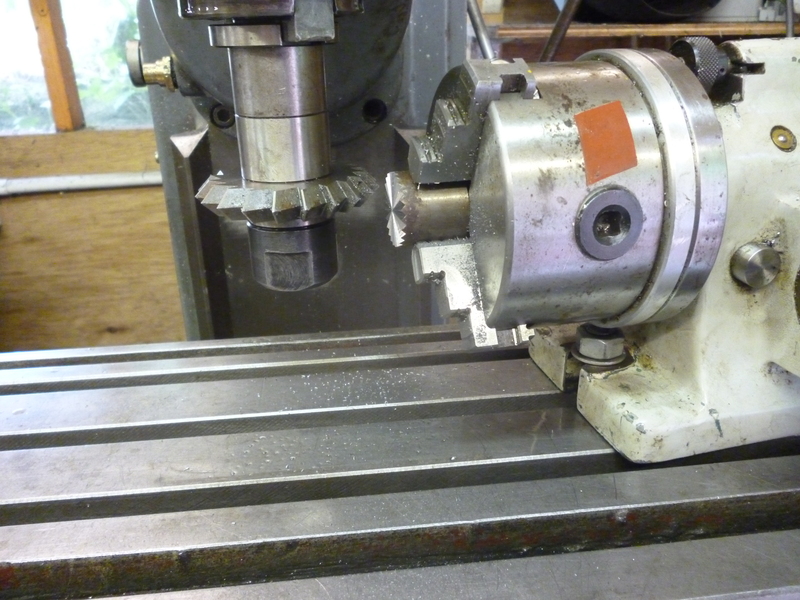 Since the angle is small it is possible to mount the dividing head at a small angle to the axis of the milling table. 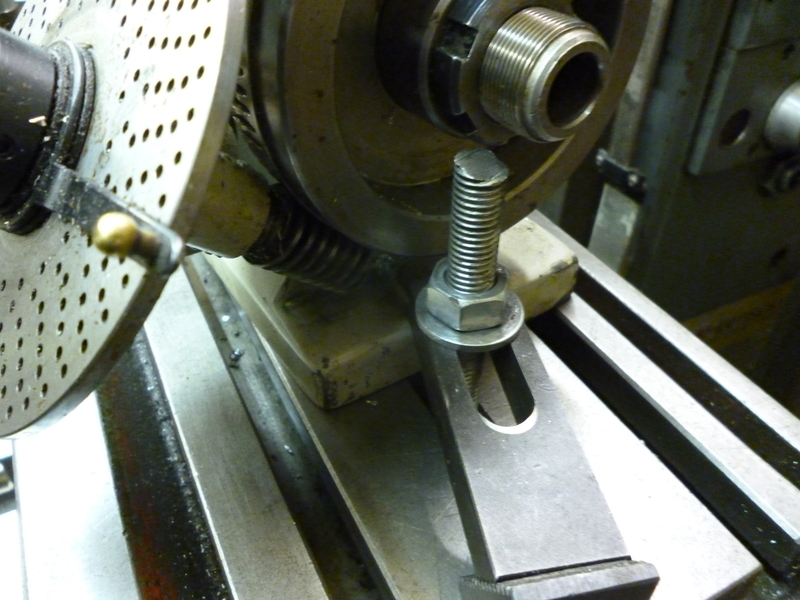 It was possible to use one bolt to hold the dividing head but the other slot did will not line up with the T-slots on the milling table and it was with a clamp. For angles greater than 45º the angle of the head can be reduced. For example, for an angle of 160º the head is tilted at just 10º. The side of the endmill will cut the top half of the tooth on the near side. The “bottom” side of the tooth is cut by cutting the same angle but when the tooth is on the far side when the “bottom” side of a tooth is on the top. The finished face gear is parted off from the bar it is on in the lathe. Would you please email me back? I am looking for something like a “face gear”, but in steel with a center hole. I have tried all the major tool/industrial supply places online (Reid, MSC, McMaster Carr, Grainger) with no luck. I am looking to make my own adjustable “arm” for a project. Thank you!